Chronic wasting disease, or CWD, is a contagious illness that affects animals, including deer and elk. It attacks an animal's nervous system; a deer with the disease may have difficulty moving, lose a significant amount of weight and then die. Research hasn't shown that it's a threat to humans, but it has decimated deer populations in places like Wisconsin and northern Illinois. So far, Texas' herds have been spared from similar devastation. 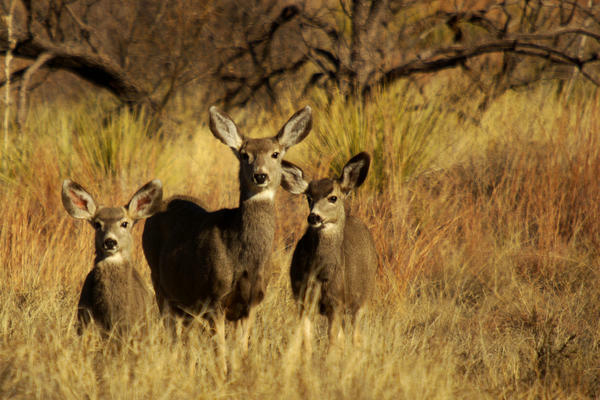 But the state's parks and wildlife department announced on Friday that six new cases of chronic wasting disease had been discovered: three in the Panhandle, and three in far West Texas. Clayton Wolf, wildlife division director at Texas Parks and Wildlife, says the good news is that these new cases are in areas where the disease has already been for several years; it hasn't yet spread to new areas. "Our agency establishes these containment and surveillance zones ... where we really focus sampling, and we adopt some rules, or have some rules associated with them to keep, to prevent us from moving the disease out of those zones," Wolf says. Wolf says there isn't really a cure for CWD, so most states have to have these containment zones to try to control the disease. "What we can do ... is keep from inadvertently moving that disease out of that zone," Wolf says. He says the disease can spread when live animals infected with the "prions" – the pathogen that causes CWD – move out of those zones, or when carcass parts are moved out of those zones by hunters. "Particularly the nervous system – the brain, the brain stem, the spinal cord – have high concentrations of prions, if there's an infected animal. So, we require that certain carcass parts stay behind in those zones," Wolf says. Wolf says many people's livelihoods depend on these animals, including landowners, hunters and deer breeders. He also says deer hunting generates over $2 billion a year. But there is some disagreement about how to deal with CWD. "The bigger disagreement is on the level of monitoring and testing," Wolf says. He says in one case, Texas Parks and Wildlife detected CWD at a captive deer-breeding facility in Medina County. As a result, the agency increased monitoring and testing of that facility, particularly because it worked with other facilities in the area where the disease could spread. But it also ramped up statewide testing, including testing wild deer in order to better detect outbreaks earlier. But some thought that was too much. "The opposition was ... against our increased testing requirements in deer-breeding facilities," Wolf says. Despite the threat, Wolf says he's optimistic about containing CWD, at least in Texas because he's confident in his agency's approach. But he reiterates the fact that there's still not a cure. "Researchers are working on vaccines, but right now ... we really don't have a strategy to eliminate it from the landscape," Wolf says. "We have to be diligent about the strategies that we [do] have." A state district judge sides with Texas wildlife officials in their efforts to limit the spread of Chronic Wasting Disease within the State’s deer population. In 2015, Deer breeders Ken Bailey and Brad Peterson sued the Texas Parks and Wildlife Department, seeking to change a century old statute in the state’s constitution that says all deer in Texas are considered public property.